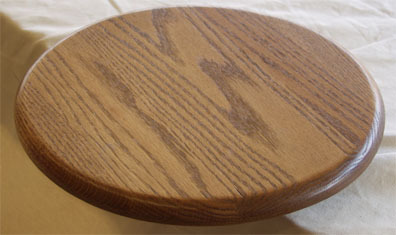 For those who want something simpler and less imposing, we have our 14” plain top lazy susan condiment tray. Still Amish made of solid oak, and featuring the same swivel base as our model with rails, but this one has a smooth radiused edge and tends to blend in better when sitting on your table. Clayborne’s has a variety of stains available, so we will be able to get something to match your existing table and chairs. Of course if you are buying a new table and chairs at the same time we can stain them all together! This one is shown in a medium oak finish.